Reads Engine, Transmission, ABS & Airbag Systems for major Japanese vehicles! 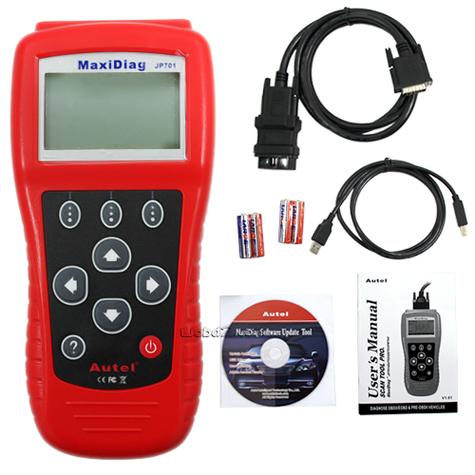 The MaxiDiag JP701 is an innovative multi-functional scan tool designed for technicians to troubleshoot engine, transmission, ABS & airbag systems for major Japanese vehicles. Reliable, easy-to-use & affordable, the MaxiDiag JP701 is a time saver & a money maker! Ãï¿½ÃÂ»Troubleshoots engine, ABS, transmission & airbag codes. Ãï¿½ÃÂ»Global OBD2/EOBD coverage (US, Asian & European). Ãï¿½ÃÂ»Powered by Uni-SCANÃÂ¢Ã¯Â¿Â½ÃÂ¢ technology with no adapters to buy. Ãï¿½ÃÂ»Supports all nine test modes of the latest J1979 OBD2 test specs. Ãï¿½ÃÂ»Retrieves generic (P0, P2, P3, and U0) & manufacturer specific (P1, P3, and U1) codes. Ãï¿½ÃÂ»Displays O2 sensor data as well as live datastream parameters. Ãï¿½ÃÂ»Data graphing ÃÂ¢Ã¯Â¿Â½Ã¯Â¿Â½ (1996 and newer). Ãï¿½ÃÂ»Reads, stores & playbacks live sensor data. Ãï¿½ÃÂ»Memory/battery backup for off-vehicle data review & analysis. Ãï¿½ÃÂ»Retrieves vehicle information (VIN, CID & CVN). Ãï¿½ÃÂ»Supports all current OBD2 protocols, including CAN (Controller Area Network). Ãï¿½ÃÂ»Extremely easy to use & highly reliable. Ãï¿½ÃÂ»Trilingual supportÃÂ¢Ã¯Â¿Â½Ã¯Â¿Â½English, Spanish, French or other combinations. Ãï¿½ÃÂ»Built-in OBD2 DTC lookup library. Ãï¿½ÃÂ»Global OBD II compliant US, European & Asian vehicles.